The Texas Mint is a division of Texas Precious Metals dedicated to crafting beautifully designed, world-class bullion products for precious metals wholesalers and retailers. Texas Mint products are distributed to some of the top precious metals dealers in the United States through Amark Precious Metals (NASDAQ: AMRK), a publicly traded precious metals wholesaler. In 2013, Texas Precious Metals commenced an ambitious program to introduce and distribute a new class of product called the "Texas Silver Round." The Texas Silver Round would become a staple in the precious metals industry from 2013-2017 by offering investors a unique value proposition. This one ounce, finely struck medallion is purer than a US Mint Silver Eagle (.9999 fine vs. .9993), less expensive by nearly $1 per ounce at the retail level, and packaged in superior boxes comprised of steel, which is distinct from the common plastic containers issued from the government mints. Another innovation was the first ever "mini-monster box," a half-monster box comprising 250 ounces of silver, offering cost-conscious investors with a less expensive alternative to a mint-issue monster box. With more than two million ounces in circulation in all 50 states, the Texas Silver Round's popularity was a prelude to the Texas Mint. In its five year history, the reverse of the silver round featured a cowboy, a longhorn, a white-tailed deer, a coyote, and a bobcat, to accompany the consistent obverse of the geographic outline of the state of Texas in the background and Texas’ iconic lone star in the foreground. In 2017, Texas Precious Metals spun off the Texas Mint as its own division with the purpose of expanding the product line and distributing these products to other national dealers. Using the Texas State Capitol as the theme for these products - a theme that will remain consistent through each subsequent year - the Texas Mint introduces one ounce gold rounds, one ounce silver bars, ten ounce silver bars, and one hundred ounce silver bars, in addition to the one ounce Texas Silver Round. Our mission is to provide value to customers through high purity and strike quality, low premiums, and superior packaging. 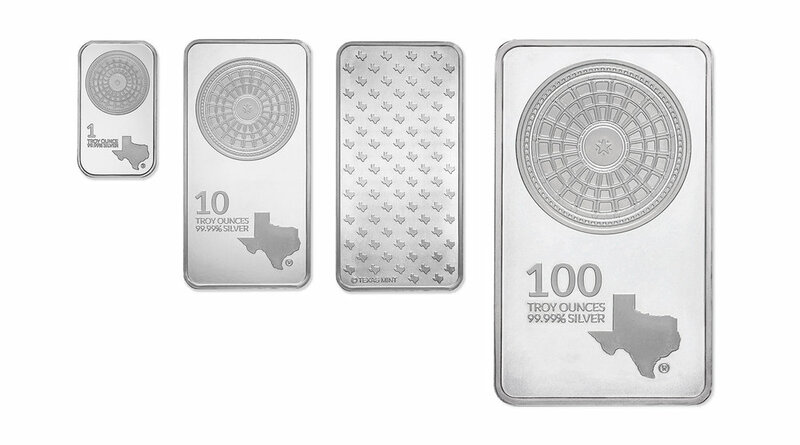 The Texas Silver Round has become iconic in the bullion industry since its inception in 2013. The obverse of the one troy ounce, 99.99% pure silver round boasts the unique geographic outline of the state of Texas and the famous Texas lone star. Three hallmarks of the state of Texas are displayed on the reverse of the round: the cowboy, the bluebonnet flower and the Texas State Capitol. Texas silver rounds ship in monster boxes of 500 rounds and mini monster boxes of 250 rounds. The Texas Gold Round pays homage to one of the most hallowed landmarks in the Lone Star State — the Texas State Capitol. Like it’s counterpart, the Texas Silver Round, the obverse of the one troy ounce, 99.99% pure gold round boasts the unique geographic outline of the state and the famous Texas lone star. This unique gold round has been carefully crafted and ships in superior packaging. The Texas Silver Bar presents a unique tribute to the state of Texas with an exact representation of the interior architecture of the state’s Capitol dome. The reverse of the Texas Silver Bar features the silhouetted Texas symbol. The bar is available in 1 oz, 10 oz, and 100 oz iterations and ships in superior packaging. The distinguished Texas Gold Bar proudly portrays a tribute to the state of Texas with a carefully detailed replica of the legendary State Capitol dome. The reverse of the Texas Gold Bar features the silhouetted Texas symbol. The “99.99% GOLD” rating conveys the true purity of this 1 troy ounce gold bar, available in a 1 oz denomination.